Action from Spalding Ladies 2nds v Cambridge South. Photo: Tim Wilson. City of Peterborough failed to take advantage of a second-minute goal from teenager Tierney Augustine in their East Division One North game with Wisbech at Bretton Gate on Saturday (October 3). Augustine has now scored in all three league matches this season, but her efforts couldn’t stop City from succumbing to a 5-2 defeat. Leanne Williamson and Charlie Paine shot Wisbech in front by half-time and Paine, Jane Peggs and Clare Apted all scored again for the visitors before Jess Amps pulled a late goal back for City. City have now lost two league games in a row, Wisbech have won two in a row, scoring 10 goals in the process. Spalding, who won Division Two North West last season, are struggling at the higher level. They’ve lost all three Division One North games so far with Royston proving too strong last weekend. Spalding were 3-0 down at half-time before rallying after the break with two goals from Emma Pybus and another from Kelly Slater. 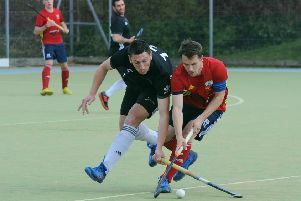 Spalding seconds were crushed 7-2 by Cambridge South seconds in Division Three North West. AJ Bunyan scored the Spalding consolation goal.